Distribute bok choy onto the center of the foil and top with zucchini. Lay cod over the veggies. In a small bowl, thoroughly mix teriyaki marinade or sauce with orange marmalade. Evenly spoon mixture over the cod and veggies. Cover with another large piece of foil. Fold together and seal all four edges of the foil pieces, forming a well-sealed packet. 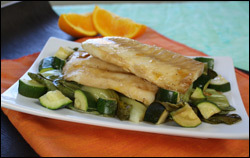 Bake for 20 minutes, or until cod is cooked through and veggies are tender. Cut packet to release steam before opening entirely. Eat up! Preheat oven to 375 degrees. Lay an extra-large piece of heavy-duty foil on an extra-large baking sheet and spray with nonstick spray. Lay kale pieces in the center of the foil. Evenly top with bell peppers and water chestnuts. Set aside. In a small bowl, combine chili sauce, rice vinegar, and garlic. Mix well. Evenly drizzle over the veggies. Place another extra-large piece of foil evenly over the baking sheet. Fold together and seal all four edges of the two foil pieces, forming a well-sealed packet. Bake in the oven for 20 minutes, or until veggies are tender. Transfer to a large bowl or plate. Sprinkle with salt and black pepper, and mix well. Serve and enjoy! . HG FYI: The recipe method of calculating PointsPlus® values counts the carbs, protein, etc., from vegetables -- even those with a value of 0*. 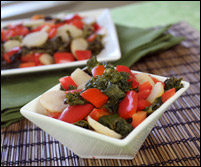 If calculated without the veggies that have a value of 0*, each serving of this recipe has a PointsPlus® value of 1*. 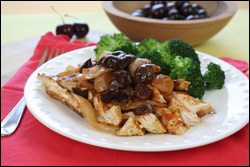 Summer is prime time for BBQ chicken, and we gave ours a fruity twist. This dish goes great with fireworks and hot summer nights. Preheat oven to 375 degrees. Lay a large piece of heavy-duty foil on a large baking sheet and spray with nonstick spray. Lay chicken strips in an even layer in the center of the foil. Sprinkle with 1/8 tsp. each salt and pepper, and evenly top with onion. Set aside. Roughly chop cherries, and then transfer to a bowl. Add BBQ sauce and mix well. Evenly pour cherry-BBQ mixture over the onion and chicken. Place another large piece of foil evenly over the baking sheet. Fold together and seal all four edges of the two foil pieces, forming a well-sealed packet. Bake in the oven for 25 minutes, or until chicken is fully cooked. If you like, season to taste with additional salt and pepper. Time to chew! Foiled again! Click "Send to a Friend" to pass along these recipes.